A battle that has been ongoing through two annual meetings and at least a year of threatening letters by Conquistador Condominium Association Manager Sharon K Stokes, may soon result in the ouster of Ms. Stokes. According to reports, Ms. Stokes, the community's property manager, has been employed by the Conquistador Condominium Apartments of St. Augustine Shores, Inc., a condominium community located within the St. Augustine Shores, since March of 2009, and made quite an impression in a relatively short amount of time. Almost immediately upon arriving, Ms. Stokes engaged in a campaign to sterilize the condo community and strip all sense of personalization and unity from the community. For over a year Stokes has attempted, through threatening letters, to remove any personal plantings around the individual units, a practice that was well accepted for many years prior to her tenure, and has continuously threatened condo owners with fines and forced removal of any personal objects from the limited common area "porch" outside of the units, including potted plants, patio furniture and holiday decorations. For two (2) consecutive years, governing document amendment changes were placed on the Annual Meeting election ballot, attempting to gain support granting the Board of Directors of the community the necessary enforcement power to control and determine what is deemed appropriate to be displayed in the common elements and on the porches. Each time the ballot initiative was defeated by a vote of the homeowners. Apparently the defeat at the polls may have been misinterpreted by the Board of Directors and/or property manager. In spite of the vote Stokes has escalated her personal war against the unit owners, including using the threat of fines and stating her intent to use any means possible to remove the items, as recently written in a letter to a unit owner "We will seek whatever remedy we need to in order to get them removed". When asked earlier today who was authorizing the unit owner letters, Stokes offered no response. When confronted with the statement that based on various conversations between individual unit owners and members of the Board it had been confirmed that no such authority had been granted by the Board, Ms. Stokes response was, "They didn't ask the right Board members!" It appears that under the control of Stokes, the Conquistador Condominiums have become the least desirable condo community from a buyers perspective, based on recent information provided by a local Realtor. While the condo communities of the Greens, Greens II and Fairview have been involved in their own beautification projects, including the use of Florida xeriscaping in the Greens Community, a practice employed by landscapers to reduce the amount of water and maintenance to the grounds, residents state that any grounds and building maintenance efforts have been nonexistent at the Conquistador Condominium complex, under the leadership of Stokes, and property values have been irreparably destroyed as a result. A long time Conquistador unit owner recently mentioned that in the thirty (30) years that she has resided in the community, the grounds and conditions are the worst that she has ever seen. "This place looks like a dump and I have never been treated so poorly in my life", was her quote. As an owner of a condominium at Conquistador Condominiums in St. Augustine, Florida, I support the following statement and request the immediate resignation of the President of the Board, Eileen Collomb and Property Manager, Sharon Stokes. Because of the continued neglect of these critical association needs, I request the immediate resignation of the President of the Board, Eileen Collomb and Property Manager, Sharon Stokes. The unit owners have stated that approximately 100 signatures have been gathered towards the effort thus far. There are 456 individual condominium units located within the Conquistador Condominium complex. This is a plea to all of you to get involved in what's going on in your very own backyard. Many of you hear bits and pieces about what is going on in our community and you're probably not sure what to believe and perhaps are even confused by all that you hear. You may not even care. You are unfortunately the majority. On the second Thursday of every month the St. Augustine Shores Service Corporation Board of Directors meet at the Riverview Club at 7:00pm. I encourage you all to attend at least once. This will offer you an honest glimpse of what is really going on in the community and how much the board cares (or doesn't care) about you, the residents. At last night's meeting I had the pleasure of meeting a couple of new people of which it was their first attendance and I think they had their eyes opened. Many times during the meeting the woman next to me expressed complete shock at how poorly the board itself interacted and she asked me if this is always the way it is? I encouraged her to keep listening. When it came time for resident input and comments, a lot of the residents' questions were met with blank stares by the President (C.E. "Gus" Kouremetis) and given no answers. When one resident asked why there was a Police Officer in attendance she received no answer. When she pressed further she was told it was for "Our Protection". Protection from what? She then inquired as to why we needed protection and was concerned that perhaps there was a danger within the St. Augustine Shores. She was told "no, he was hired by a private citizen". Why? The president said he was moving on to another subject and an uproar from residents in attendance demanded to know what was going on. There was never a direct answer. It's unfortunate that the President of our board cannot put his own personal agenda and feelings aside in order to listen to ideas to help the community. Under his leadership, which I personally feel is ineffective at best, his actions, or inactions may very well be the downfall of The St. Augustine Shores. This, coupled with the constant "passing of the buck" and not taking responsibility for missteps, mistakes, et al, does not bode well for our community. Any way they want to spin it, they'll spin it… so be it, however, time will tell and the truth will come out. Our faithful, public servants, the St. John's County Sheriff's Department, are called to our community quite often, and many times to the Riverview Club. Why? It's called wasting County monies, resources, and time. It's called paranoia of a few as a ruse to keep information from being given to the community. What information is so damning that all of this is necessary? I know what it is, and it is ugly, deceitful and may border on criminal. Our sheriff's department should be able to do their jobs without being called to our Riverview Club to sit and watch people bicker, they should be out protecting our community. So, I again beseech you to attend just one single board meeting and see for yourself how your community is run and where your hard-earned dollars are going. I don't know about you but every penny I earn matters to me. If you care to know more, have a concern, or wish to get additional contact information, please email me at: toyc34@yahoo.com. I know that I may receive emails from those that have a personal interest in keeping things "the way they are" or "under wraps" but just know that I will turn over anything deemed threatening and harassing to the proper authorities and I am tech-savvy enough to figure out from what computer it originated from. If you have something to say, please do so in a respectful, constructive and adult manner. Thank you all for reading. Condo, homeowner associations and cooperatives in Florida are now subject to a bill that went into effect on July 1. Senate Bill 1196 addresses rental restrictions, access to common elements (clubhouse and pool), elections and who is eligible to be a director, collection of rent and assessments and many other new issues that have come up because of the economy. Donna DiMaggio Berger is executive director of the Community Advocacy Network, created by her law firm of Katzman, Garfinkel & Berger, as a statewide, nonprofit advocacy group to promote positive community association legislation. Berger is the managing partner of the law firm. She speaks on this issue before community coalitions. She answered some questions recently about the new bill with a reporter with the Florida Sun Sentinel. Q: What's the biggest impact of this bill? A: Retrofit relief for thousands of condo associations for sprinkler systems and elevator upgrades and hardwire smoke alarms. This bill exempts condos and cooperatives that are less than four stories high with an exterior corridor from installing a manual fire alarm system. Condos and cooperatives can vote to forego putting a sprinkler system in the common areas of a high-rise. It created a moratorium of five years with certain provisions for modifying existing elevators and escalators. Q: How will it help associations suspend the rights of residents who haven't paid their fees to continue using the common areas? A: It makes people angry to be sharing common areas, including the clubhouse, tennis courts and swimming pools, with unit owners who haven't paid their condo or homeowner fees for years. HOAs always had that right, but it had to be in their governing documents; now it can be by statute. Condos can suspend use rights of owners more than 90 days delinquent at a regular board meeting. In an HOA, they need to give 14 days notice to the owner they're attempting to suspend and have a meeting of three members not on the board. It will be challenging to enforce this. How are you going to keep them out of the clubhouse? Are you going to post a guard there? Having a right and exercising it are two different things. Q: What do homeowner boards have to do now about these changes? A: This bill gave a lot of rights to associations by statute that ordinarily they could only find in their government documents, such as suspending use and voting rights, fining and collecting rent. They will need to have a well thought-out plan of action. This is a brand new law with significant consequences. Parts of this bill undoubtedly will be challenged. The collection of rent will be vulnerable to challenge. There are some issues with wording that leave it open to varying interpretations and impairment to contracts after the fact. Q: How big a deal is this new law and did it have a rough road to passage? A: It is a 103-page bill that just missed the government's veto because of the retrofit language. The fire marshals and sprinkler companies were pushing hard. CAN and our advisory council members had a big role in getting it passed. The current law only required sprinklers in hallways, not the units. There will continue to be fire incidents…and typically will only impact the unit if it's a concrete block building. The bill allows the communities to decide for themselves whether or not they want to sprinkle. Q: What's missing and what was gutted from the bill? A: Condo board member eligibility. We wanted to see it transported to HOA boards. There's nothing in the HOA act that can prevent a felon from serving on an HOA board. We're trying to achieve some parity of the statues. Why should condos restrict felons and not HOAs? Why do we require or condo directors to say they read the documents and or attend a course within 90 days but not HOAs? I would have looked at those types of issues to try and achieve more parities. Q: Is there anything else you would have liked to see? A: HOAs with older documents would be exempt from having them extinguished. They should just be exempt [because it's expensive and time consuming to do.] We tried it once before and it got shot down. It would be the right thing to do. Q: Overall, what do you think of this law? A: Overall on balance it's an incredibly positive bill. Is it a cure all? Absolutely not. This bill took some bold steps forward. Q: What will be CAN's next campaign? A: Rogue board member making bad decisions. Boards not handling hurricane claims correctly, for instance, or where vendors are taking direction from one board member. Your entire investment is at risk because of one board member's decision. Q: What's your biggest piece of advice for residents in these communities? A: Ignorance is not bliss in a community association. You need to know what's going on. 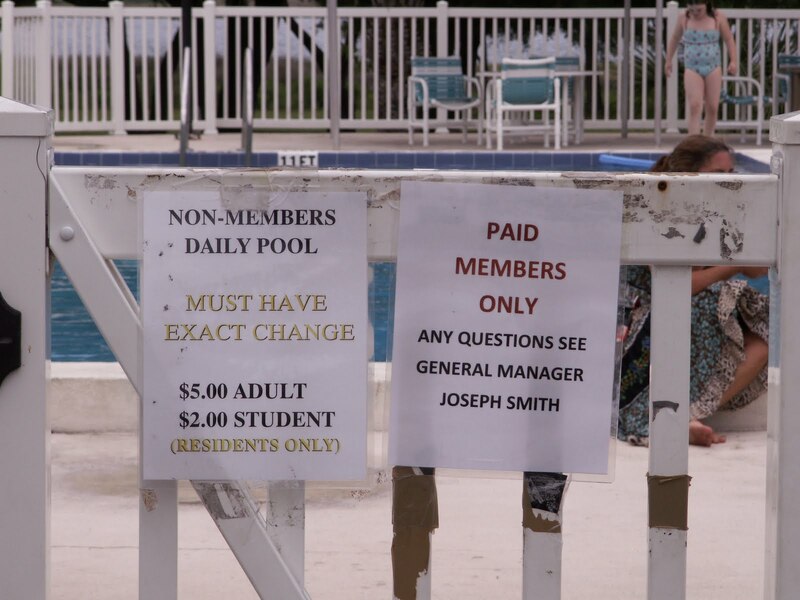 SHOULD THE RIVERVIEW CLUB POOL BE OPEN TO ALL SHORES HOMEOWNERS? No - I do not think the Riverview Club pool should be available to all Shores homeowners. If you are not in favor of opening the pool to all Shores' homeowners then are you stating that you support the selective enforcement of the recorded Deed Restrictions for the Shores? How can a governing Board fine or take legal action against a homeowner for violating the same documents that the various Boards of Directors have violated for years? Do you see a double standard? "The property and all portions thereof, is restricted to the sole uses herein above set forth and, without enlarging upon the said permitted uses and further intending to restrict and confine the property to the uses set forth, the said permitted use set forth shall not be deemed to include directly or indirectly any residential or commercial use." Leasing out the common areas of a homeowner's association is considered "Commercial Use" of the property, which is a violation of the original PUD, the Deed Restrictions and a breach of the Fiduciary Duties that all Board members are elected to uphold, pursuant to Florida Statutes 617 and 720. It is strongly suggested that all Board members familiarize themselves with the governing documents of the Corporation before taking the word of any other Board member or manager as truth. It is well documented that all Board members are responsible for their own personal votes and their own careful research and understanding of all information available, prior to voting on any matter, especially that which could adversely affect any homeowner(s) in the Association. The exact responsibilities in order to avoid person liability can be found within the Florida Business Judgment Rule and Florida Statutes 617, Fiduciary Duties. This also applies to the areas of homeowner rights and responsibilities, ie; voting to foreclose against homeowners that may or may not owe association fees without asking questions and having any personal knowledge of if the homeowner owes association fees, or how much they owe. Relying on what an attorney may think and/or another Board member's point of view does not satisfy the Business Judgment Rule or a Board members personal Fiduciary Duties. In fact, such decisions have cost many Florida homeowner associations a lot of money and its individual board members have had to reach into their own pockets due to their own personal decisions. It is always best to totally research all topics that could potentially affect any homeowner(s) in a homeowner's Association and be prepared to vote in such a manner that you know that your vote can be defended, by you, with relative confidence, in a Court of Law. A Board member that follows the above suggestions will almost always be on the right side of the law and is truly working for the community, as he or she was elected to do. SHORT LESSON ON CONDOMINIUM & HOA LIVING IN FLORIDA! Okay folks, here is a short lesson on Condominium and HOA Living in Florida: This week's lesson: Let's start with the Department where you go to file a complaint. "The mission of the Division of Florida Land Sales, Condominiums and Mobile Homes is to assist our customers by educating them about their rights and responsibilities as provided in the regulatory acts we administer; and to respond timely and appropriately to our customers thereby providing enhanced public protection, quality service, and increased customer satisfaction." Anyone care to guess what the DBPR means by "enhanced public protection" and "customer satisfaction"? Enhanced public protection - We have an 800 number you can call, but if you are in any serious kind of trouble, don't call us! We can't interpret your Condo/HOA documents, we can't represent you legally on any matter, we can't even enforce the laws, because it would be a conflict of interest to "our customers." Customer Satisfaction - Keep the statistics low so no one figures out that there is a monstrous problem in Condos/HOAs. Keep the complainants going around in circles until they sell their unit and stop filing complaints. Customer - Someone other than those unlucky few (millions) who live in a condominium or HOA and comply with Section 718.501(2)(a), Florida Statutes and pay to the division an annual fee in the amount of $4.00 for each residential unit. Breach of Fiduciary Duty - If you do it, everyone knows you did it. But it's a conflict of interest to satisfy any customers by actually finding anyone guilty of it and penalizing them. Task Force - A group of our finest customer satisfaction experts. They're highly trained in listening to thousands of complaints from residents all over the state and then doing absolutely nothing about it. Official Records - Any bit of incriminating evidence still left after going through the paper shredder. Law Enforcement will not ever need to see any of it, so it makes really good sense to get rid of it. It increases customer satisfaction. No proof that some board member took the money = No Complaints = Higher Customer Satisfaction. Education - Lessons in enforcement and creating lawsuits. Paid for at an annual rate of $500,000 by the condo owners. The DBPR chose to hand this "task" to the Community Association Institute, a trade organization of lawyers and service providers, known to fight any consumer-friendly bills in Tallahassee. This money will definitely help the CAI to gain more influence in Tallahassee to defeat homeowners' initiatives! Enforcement - Bother the hell out of the customers by sending them letters with pretty "Right Here, Right Now!" logos and wait until the customer laughs at it, takes it to court or moves to Georgia. Violation Letter - This is divided into three parts. Informational Letter, Written Warning, and we don't know yet what to call the third, so we'll just call it Administrative Action. Informational Letter - Welcome Letter. Usually accompanied with brochures of Florida's Capitol and pictures of bull droppings. Written Warning - Welcome Letter, brochures of Florida's Capitol, lots and lots of pictures of bull droppings and complimentary references to "The Yellow Book," closely resembling but not to be confused with the Yellow Pages. Administrative Action - Scare the hell out of people thinking of making complaints and ruining the customer satisfaction statistics by threatening the complainants with fines of up to $5,000 per violation. Fines - Toll free calls to 1-800-226-9101 are billed at a rate equivalent to $18 for each serious violation mentioned. But at no rate will the total of any one phone call exceed $5,000 billable to caller and all his/her neighbors. There is no limit to the amount of violations, but in order to keep costs down and keep the customer satisfaction statistics high, only one serious violation per customer is recommended. Community Association Manager - One of over 8,500 currently licensed magicians in Florida who can make millions of dollars disappear and not ever be held accountable for it. It's simple. The person gets an attorney friend and makes him the registered agent for all the associations they entertain. When a problem occurs, the CAM blames the Agent, the Agent blames the board, the board blames the unit owners, the unit owners fork up the bill. Registered Agent - The person who receives all the complaints and replies to them. This person usually bills the association at a rate of over $300 per violation to provide answers. Should the response cause the association to incur a fine, this person's rates just doubled. Yellow Book - A list of telephone numbers of the wealthiest and most powerful legislators and attorneys in Florida. "718" and "720" of the Florida Statutes, refer to their hourly rates. The higher the number, the higher the hourly rate. The formula is really complicated and only a skilled DBPR employee can tell you how it works. Here is an example, Section 718.501 violations are billed at about $510 per hour, while 718.1255 are billed at $1255. Accountability - (Pronounced, A-Cow-in-Tabul-eats-tea) Who knows what this one means! We couldn't find it in the Yellow Book, somebody must have torn the page out. Author's Note: Not all board members, volunteers, condominium associations, home owner associations, attorneys, registered agents, legislators, community association manager and employees of the DBPR use the above dictionary. Many of them want to provide real enhanced customer protection, the kind where homeowners are protected from losing their homes for owing four cents to their association, the kind where you protect homeowners from abusive boards by going after the board members who break the law. Keep in mind the torture and cruelty those customers go through only to find out three years later and getting deep into the system that "There is nowhere else to go!" The problem is ... Florida has been using the same dictionary and Yellow Book for many, many years and nobody has the guts to put the above definitions in the Florida Statutes. Why? Who's running the show? Please bring us peace, please do something about this huge problem. Just do your job and put one of the violators in jail! Join the Campaign to Bring Peace to Florida's Residents Living in Deed Restricted Homes and Condominiums. 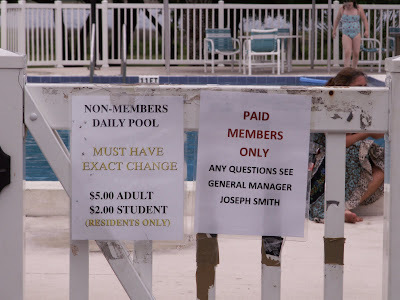 Just don't try to access "Your" community swimming pool! Below is the last paragraph contained within Section one (1) USE RESTRICTIONS in the Deed Restrictions for the parcel that contains the community pool. The link to the Restrictions can be found HERE. Who is responsible for maintaining conformity to the Governing Documents and Deed Restrictions of the St. Augustine Shores? Would it be the General Manager? Mr. Smith ... it's time for you to go!! By the way, leasing out the common areas of a homeowner's association is considered "Commercial Use" of the property. Definition of "commercial"; prepared, done, or acting with sole or chief emphasis on salability, profit, or success.